Romtec, Inc., a leading manufacturer of public restroom buildings, provides engineering, prefabrication and construction of a wide variety of structures for parks and recreational facilities. Hundreds of different floor plans are included in the buildings and shelters. Romtec additions to its restroom facilities include storage and concession rooms, along with roof extensions for exterior shelter. Complete buildings are available in solid concrete and steel-frame construction. All fixtures and hardware are included, and full architectural plans and specifications meet all national building codes. Turnkey installation is available as well. With more than 50 years of manufacturing experience, Americana is committed to building custom shelters, dugouts, pavilions, walkway covers, fabric or aluminum awnings, and smoking enclosures that enhance the quality of life. The anti-graffiti powder-coated finish on the recycled aluminum and steel components is environmentally friendly and allows graffiti to be removed easily. Americana's all metal shelters can blend beautifully into your natural environment. Standard or custom colors on the shade-producing shelters allow you to create the right atmosphere for a refreshing and cool retreat. For a year-round enclosure, the Glulam Frame Fabric Tensile Structure is innovative for the industry, especially for tennis court applications. The wood beam combined with the fabric creates a soft and attractive appearance both inside and outside of the structure. The system offers an inexpensive, attractive and practical solution for year-round tennis by creating a space with a fully controlled environment, without the cost of air conditioning in the summer and drastic reductions in heating costs in the winter achieved through its translucency and solar heat gain. The roll-up side openings provide ventilation when desired. Hunter Knepshield's restroom facilities include solutions for a wide variety of situations with fast turnaround and simple site preparation. Pre-manufactured for economy and ease of installation, the buildings are pre-plumbed, pre-wired and shipped ready for placement. Interiors are designed for low maintenance, including wall-to-wall, floor-to-ceiling reinforced fiberglass for easy washdown. A variety of plumbing choices, including composting toilets, chemical toilets and flush toilets, are available to match on-site resources. With more than a decade of experience in the manufacture of restrooms and modular buildings, WalCon has installed buildings throughout the United States in parks, golf courses and roadside rest areas. Remember, "If It's Not A WalCon It's Not The Best." J.F. Fitzpatrick Industries is a leader in state-of-the-art restroom buildings. To accommodate specific needs, the options include various configurations. Setting Fitzpatrick designs apart from competitors is the gleaming white gel-coated, molded fiberglass, one-piece inner body. The interior requires no painting and stands up to years of public use, while maintaining its new look. The building is completely factory built, delivered by Fitzpatrick and assembled by Fitzpatrick staff on site. Poligon designs, engineers and manufactures a large variety of tubular steel shelters, gazebos and pavilions and is recognized by national architecture firms and city government agencies as meeting the highest manufacturing standards in the industry. Shipped as knocked-down, pre-engineered packages, Poligon buildings are bolt-together tubular steel frames (no field welding required) with a powder-coat finish and roof decks of metal, tongue-and-groove yellow pine or sandwich panels. Poligon offers more than 100 standard original products and custom designs for shelters, gazebos and pergolas covering weddings, concerts, carousels and athletic events around the world. Pay and Display multispace parking meters offer a means of supporting temporary visitors to your facility, while protecting revenues and lowering operation costs. 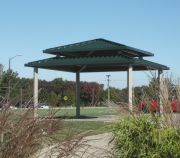 The shelter is fabricated from structural steel tubing and designed to draw your patron's attention to the equipment, offers a convenient shelter to protect patrons during inclement weather, keeps currency dry while transactions take place (which eliminates unnecessary jamming of equipment), and protects your equipment. Shelters arrive fully assembled, complete with glazing, lighting, signage and heating (if required). Preassembled shelters are easily positioned over newly installed or existing pay and display equipment, making installation fast and easy.